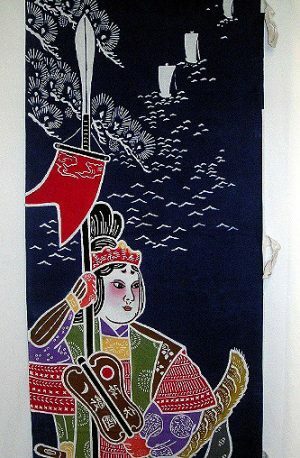 This stunning Boys Day Banner relates the Legend of Izanami, “the female who invites.” She and her brother, Izanagi, are said to be responsible for the creation of the Islands of Japan. 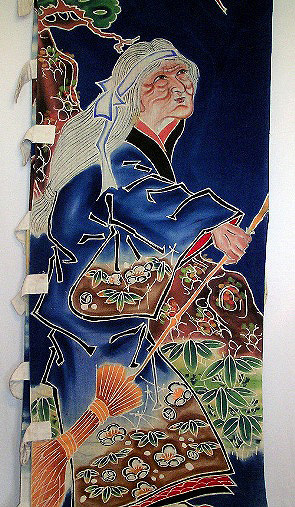 Their history is recorded in the Koji-ki which contain the traditions of the Japanese race. Among their offspring is Amaterasu, who is worshipped as the direct ancestress of all of Japan’s emperors. 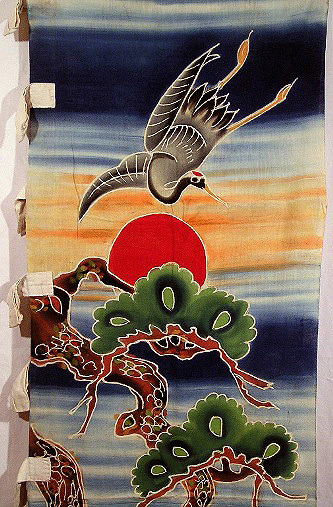 Among the other symbols directly related here are the elegant Mandarin Crane (“Tsuru”), whom legend states took over 1000 years to fly to the Sun. Thus, the Crane is recognized as a symbol of long life, as well as good fortune. The dramatic Pine (“Matsu”), also represents long life, as does the “Minogame” or long tailed Tortoise which is believed to live to an exceptional age and develops a long flowing tail. 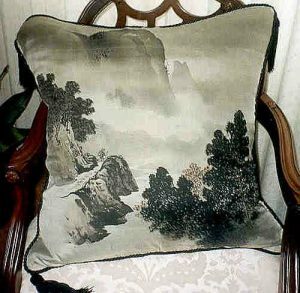 No two Banners are exactly alike, as each Banner was a hand painted gift from the maternal grandparents, who commissioned the design of the Banner, from the artist to their grandson who aspired to the manly characteristics portrayed by his noble ancestors. Heirloom banners are one of a kind. 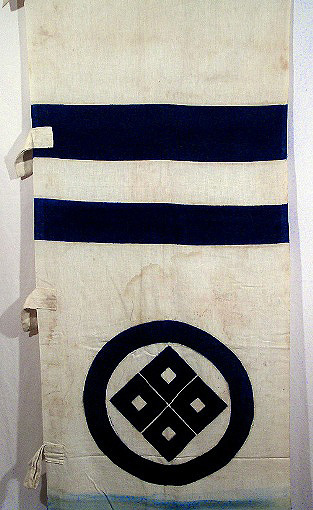 The Banners were painted entirely by hand and never dip-dyed. 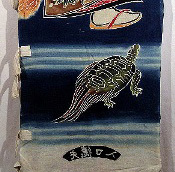 These enormous Banners exhibit dazzling colors that were created by brushing pigments or “Ganryo”, usually in a soybean-liquid binder, onto the surface of the fabric in a manner similar to Yuzen: the design is outlined in rice paste with a cylinder and then filled in with the desired pigment color. This brilliant heirloom Banner includes the family crest or “Mon,” which is the pictorial symbol of the family. 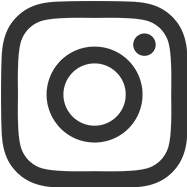 The crest is based on that of the Square (Mesh or “Meyui”) Eye, an ancient pattern that has been described as “eye tie.” This is in reference to an expensive dyeing process in which the material is puckered and tied before coloring, in order to create a spotted effect – a fabric that is also remarkably resilient and, thus, long lived. This is an important historic piece of Japanese History in the form of a Boys Day Banner commemorating one of Japan’s families. Unusual light weight cotton Banner with hand painted design in excellent condition. Original tabs intended for hanging the Banner outdoors vertically, still attached.